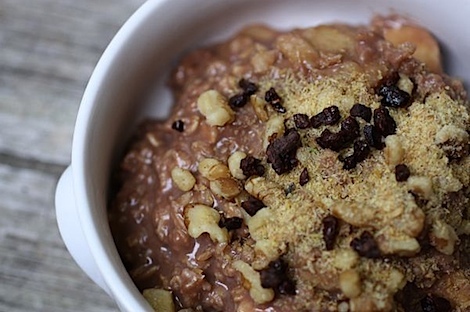 Breakfast was an amazing bowl of oats! 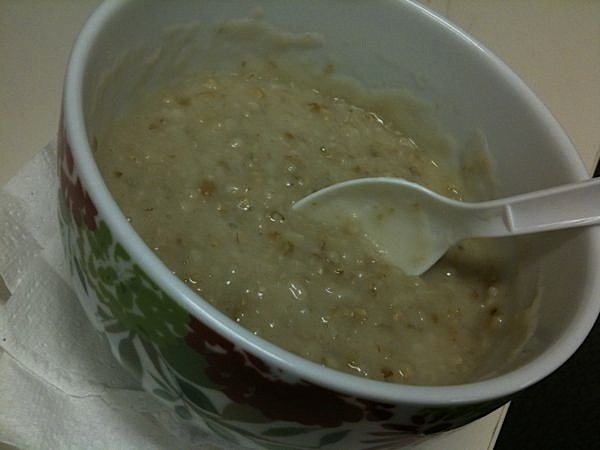 I swear when I haven’t had my oat fix in awhile I start craving it! 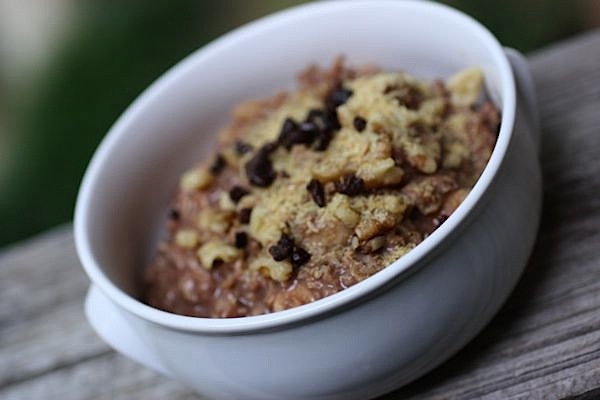 Today I made oatmeal for me and hubby: Banana Chocolate Oats. Sounds decadent but the bananas were my only sweetener. I did sprinkle a lil sugar in hubby’s because he likes his sweeter. 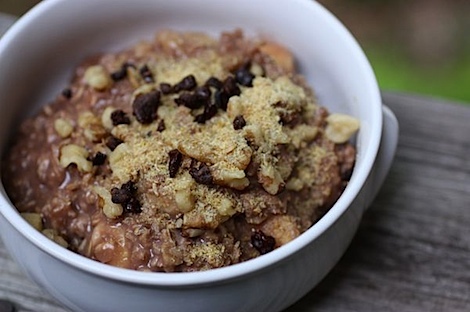 In the bowl: oats, milk, water, cocoa powder, sliced banana, walnuts, cacao nibs, flaxseed meal. Did anyone celebrate Starbucks Monday with me?! 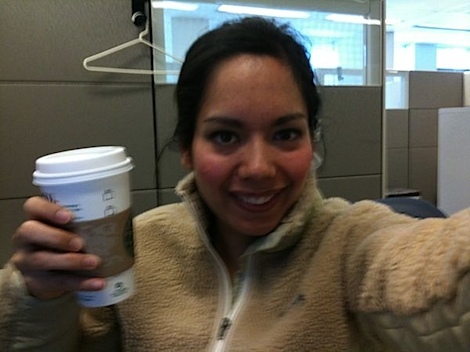 I had a grande vanilla soy latte! I depended on the freezer for my eats today. You guys know I don’t really like frozen meals, but if I’m going to have one, the Organic Bistro ones are pretty good. 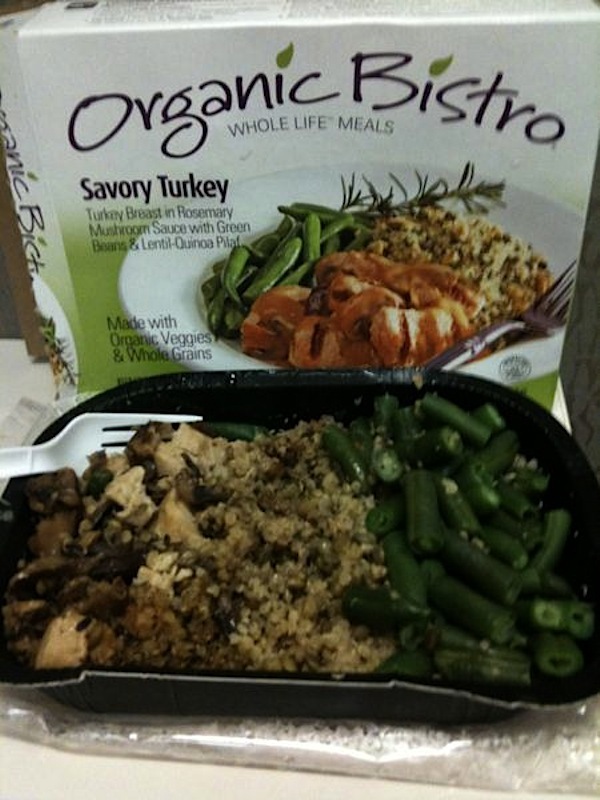 I enjoyed this savory turkey flavor – esp the mushroom sauce. The green beans weren’t too mushy either. 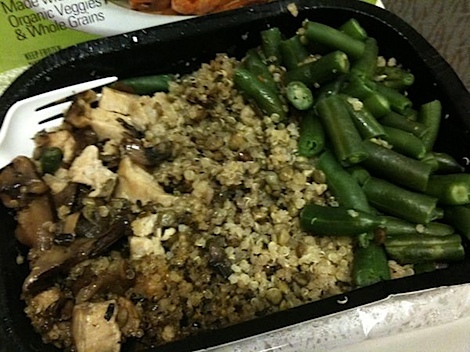 Not to mention it came with quinoa (I’m a big fan of quinoa)! Neat, no?! Snack = TJ’s frozen steel cut oats. Kind of weird to 1. have oatmeal twice in one day and 2. have oatmeal without toppings. It was pretty good as is. 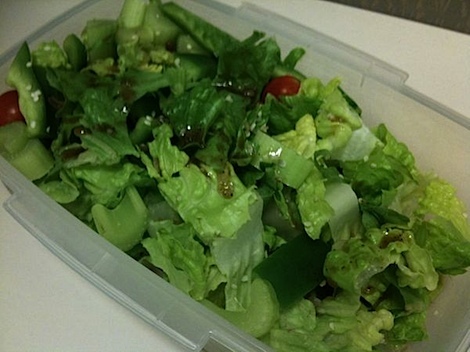 Lunch #2 = romaine salad with green pepper, celery and cherry tomatoes. Plus sunflower seeds, hemp seeds and balsamic vinaigrette. Pre-workout snack = Cherry Pie Larabar. Well…just half. I ate the other half post-workout today. Post work I had a double header of ZUMBA! I struggled a bit energy wise in class one. Between classes I downed this Vita Coco coconut water. I think the coconut water really gave me an energy boost! I felt more energized during the second class (yes! after I already worked out for an hour!). Hubby actually signed up for our Costco account today (yay!) so I had him pick up more coconut water. 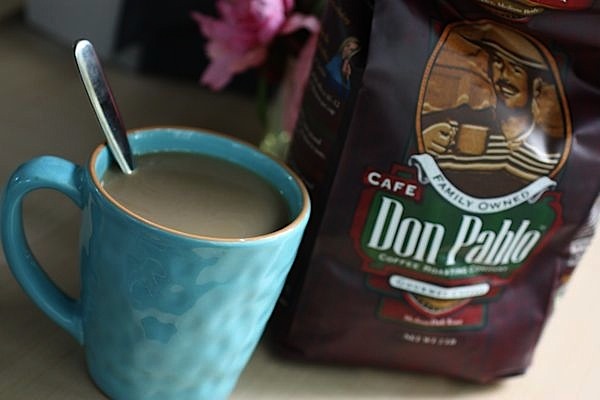 It’s such a good deal there and I think I’m only going to be drinking more and more of this stuff! 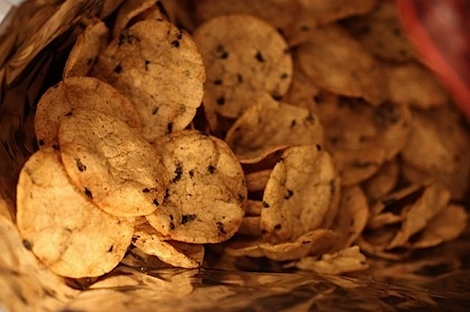 He also got me some rice milk and some of those brown rice chips (addicting! ), which I munched on pre-dinner. And since I didn’t get home till close to 9pm (I’m such a chatty Cathy post workout! 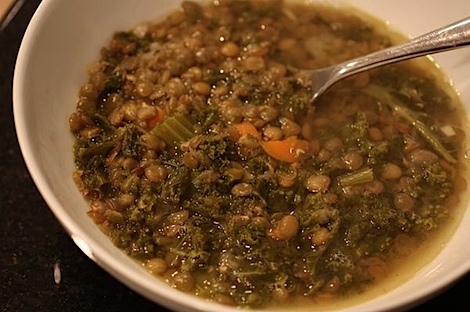 ), I opted for some Lemony Lentil soup (heated stovetop from frozen). 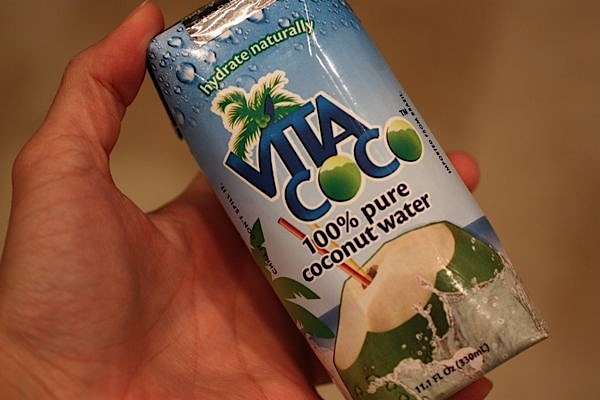 What’s your favorite way to hydrate during your workouts? I looove me some coconut water! I don’t do any crazy working out (who am I kidding, NO working out – ha!) but I am breastfeeding my 6 month old which takes a lot of hydration. I find that drinking one coconut water a day along with regular water keeps me really well hydrated and I think it’s even helping me shed some baby weight! I tend to stick with water. If I am going for a long run/workout, I will make sure that I am constantly sipping water the day (and hours) beforehand. Afterwards, I’ll take a sports drink to replace electrolytes if I’ve been sweating a lot. I’ve never tried coconut water; I’ll have to pick some up and see how I like it. I’m really thinking about jumping on the Starbucks Monday wagon. I am yet to try coconut water but I have heard great things about it!!! I only do water during workouts. I like the coconut water, but can’t do it while exercising. I want to make your soup…even the leftovers look great! And you are just gorgeous (in case no one has told you that today). Omg…this comment made my day. You are so sweet! It’s great as leftovers and even freezes well! I usually just drink water. Gatorade and stuff is way too sweet for me and I can’t afford to drink coconut water everyday! haha, silly Bailey! They sure do love their food, don’t they?? We love Costco! They have a lot of great stuff and a lot of pretty healthy stuff if you look around. 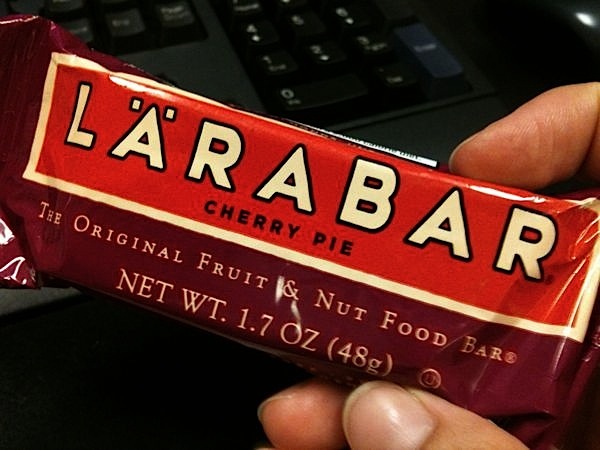 The first Larabars I ever had were from Costco! I didn’t know they had coconut water though (I sometimes don’t hit the drink corner). I’ll definitely be getting some of that there sometime! i only like plain water during workouts. anything else makes my stomach upset. Depends on the size. 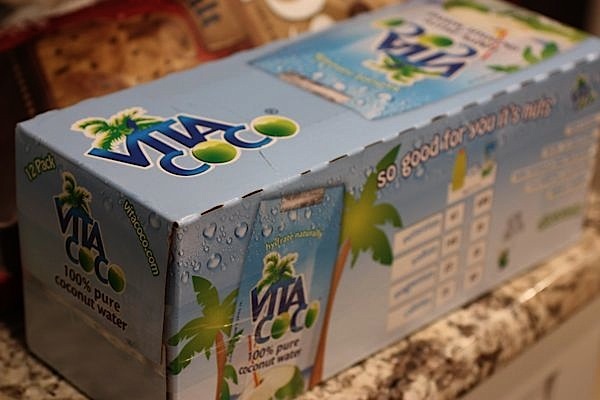 The Vita Coco drinks I’ve been having are 11.1 ounces and 60 calories (and 15 g of sugar).